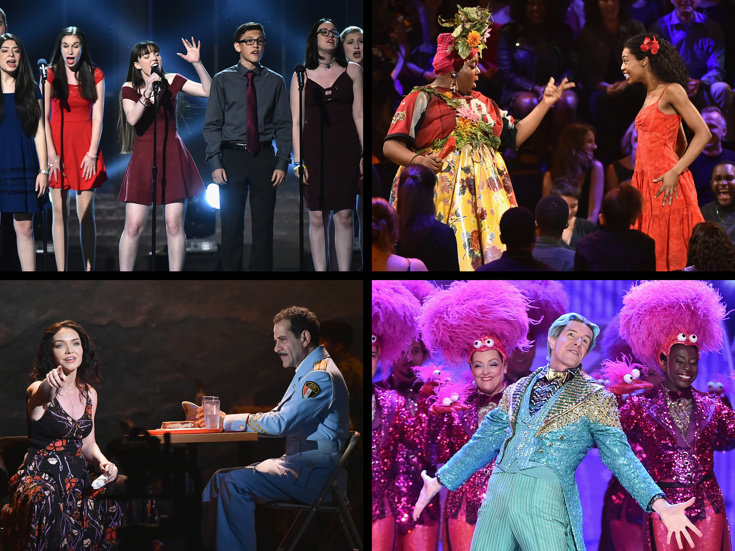 Performances at the 2018 Tony Awards: Marjory Stoneman Douglas High School Drama Club, Alex Newell and Hailey Kilgore from "Once on This Island," Katrina Lenk and Tony Shalhoub from "The Band's Visit" and Gavin Lee from "SpongeBob SquarePants"
The Band's Visit swept the Tony Awards with 10 wins (and none for Gretchen Wieners, bye!) but that doesn't mean that other musicals didn't get to show their stuff on stage at Radio City Music Hall June 10. We asked fans to rank the musical performances from the night, including songs from hosts Josh Groban and Sara Bareilles, as well as a moving tribute to the victims of the Parkland school shooting. So, which number had audiences at home laughing/cheering/crying/snotting the most? Frozen's Patti Murin started off the medley before Ice Queen Elsa (a.k.a. Caissie Levy took over.) Sadly, there was no dress reveal—they've got to save some of the Disney magic for the show—but a very quick change into "Let It Go." Opt-ups abounded! Squidward's show-stopper, lead by Gavin Lee with vocal and four-way tap-dancing prowess, impressed fans and featured pink, feathery, Muppet-handed Fosse girls. A modest number for the most awarded show of the night, sung with elegance by Best Lead Actress in a Musical winner Katrina Lenk and listened to with aplomb by her co-star Best Lead Actor in a Musical Tony Shalhoub. Bring in the sand pit! As Goddess Asaka, Alex Newell belted and riffed with all the fierceness of a Tony snub vindicated. Members of the Marjory Stoneman Douglas High School drama club, whose teacher Melody Herzfeld was honored with the Excellence in Theatre Education Tony, performed the Rent anthem to pay tribute to the victims of the February shooting at their school. Soloist Kali Clougherty wowed audiences by nailing the high note, and the group garnered a well-deserved standing ovation.